Another summer. Another Summerlicious. Toronto diners rejoiced at yet another season of fabulous food at an affordable price. Whether chefs hate it or love it, it’s a chance for them to showcase their food and restaurant to potential new clientele, while still welcoming their regular customers. I originally had reservations for three restaurants, but unfortunately, one of them got cancelled by the restaurant. In the end, my Summerlicious was themed around “museums,” as both restaurants I ended up going to were at Toronto’s two most well-known museums: c5 at the Royal Ontario Museum and Frank at the Art Gallery of Ontario. My first stop was to c5, which is headed by Chef Ted Corrado. 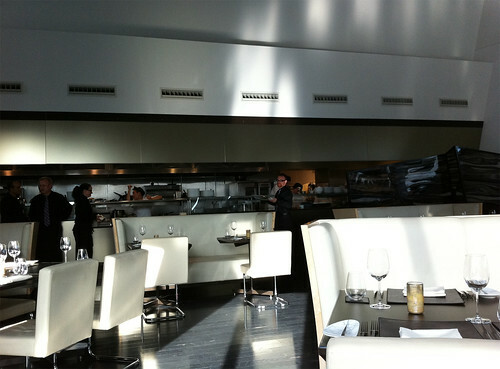 While it was my first time at c5, it wasn’t my first time sampling a Chef Corrado dish. A few months back, I went to Marben’s Sausage League, where Chef Corrado was battling it out with Chef Eran Marom of Marron Bistro. 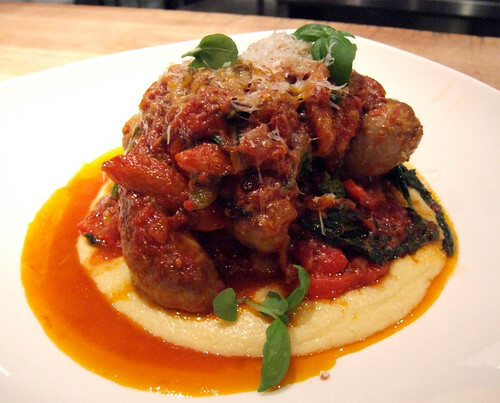 It was Chef Corrado’s interpretation of pork Calabrese sausages served with creamy polenta, rapini, tomatoes, and parmiggiano-reggiano that won me over, as well as the majority of the diners that evening. c5 has been on my list of restaurants to try for a long time, but after that dish, I knew I needed to go sooner than later. What attracted me to the c5 Summerlicious menu was the thought and care that obviously went in pulling it togther, featuring seasonal ingredients and a nice balance of light and refreshing to hearty and comforting. Great appetizers choices, from an arugula and strawberry salad, to cured meats, to seared tuna. The entrees offered up pork, fish, and a vegetarian option. And the desserts? It had me at panna cotta. c5 is housed within the “eyesore” as I like to call it—or more appropriately, the Royal Ontario Museum (I was never a big fan of the new re-design, can you tell?). It took my friend and I a little bit of sleuthing around to find the proper entrance of the restaurant. After a few wrong turns, we finally found the right door, walked down a corridor, and went up the elevator to the 5th floor. The dining room is simple and modern—chic but not overtly cold, despite the black and white décor. What took my breath away was the gorgeous view of the Toronto skyline in the distance. I passed up wine (although they have an excellent selection of VQA wines—I approve) after taking a look at their cocktail menu and ordered up a mouth-watering Blood Orange and Yuzu Margarita, made with orange peel-infused tequila, freshly pressed orange and yuzu, agave nectar, and pink Himalayan Mountain salt. 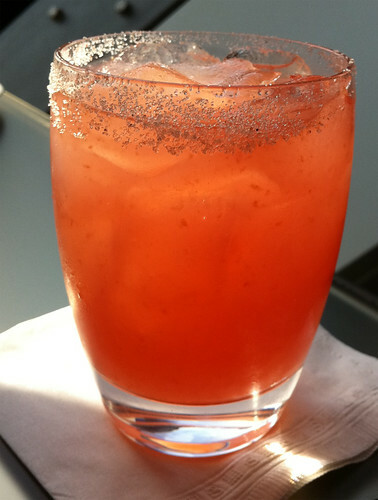 It’s not the typical margarita that I’m used to—which comes all frosted and slushy-like. This is pure juice and tequila that’s been shaken and well-chilled. Oh so refreshing on a hot summer day! 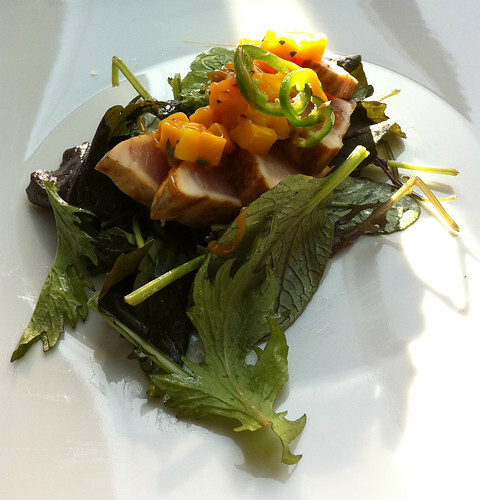 I started with the Seared Albacore Tuna, served with a refreshing mango and mint salad and a soy reduction. It looked beautiful as it arrived to the table, with all the summer colours scattered about on the white plate. I was happy to find five generous slices of Albacore tuna, perfectly seared and seasoned, with a bit of a spicy kick to it. 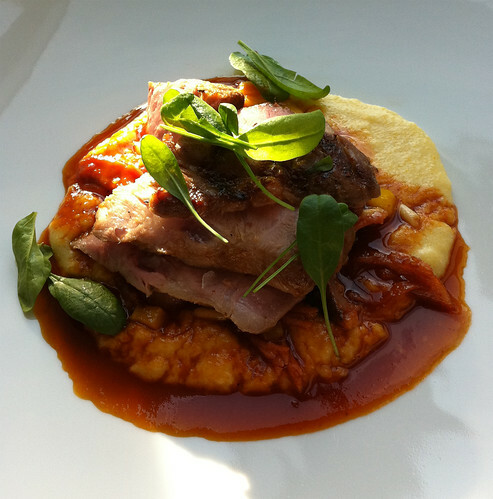 For my entrée, I had the duo of Tamworth pork—pork soulder and smoked pork hock served with polenta, chorizo cacciatore, yellow peppers, pine nuts, olives and baby spinach. I wish you could have smelled this dish! It was beautiful done and all the flavours went so well together. The pork was melt-in-my-mouth tender, and while this isn’t what you would automatically think of as a “summer” dish, it didn’t feel heavy at all. I think the cacciatore helps cut through the fattiness of the pork (although it was a fairly lean piece of pork, which was nice). The creamy polenta was the perfect accompaniment, and brought back memories of Chef Corrado’s sausage dish I had at Sausage League. It’s so homey and comforting, like it came right out of nonna’s kitchen. It’s no surprise then that I ordered the panna cotta, one of my favourite desserts. 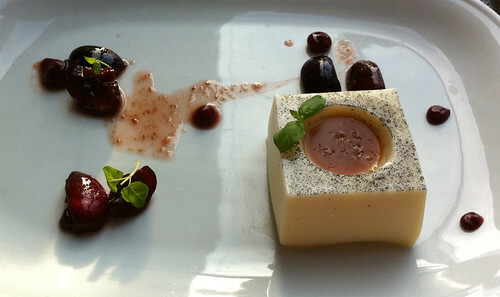 The panna cotta was served in a unique shape—square rather than circular or in a cup. A little dip in the centre created the perfect vessel for some caramel sprinkled with a little sea salt brittle. So creamy and light, this was absolutely dreamy. The verdict? It did not disappoint. I had high hopes for c5 after getting a taste of what Chef Corrado was capable of in the kitchen, and I loved every bite of my Summerlicious experience at c5. The space is unique and roomy (and gorgeous to watch the skyline in the distance slowly come to life as the sun sets), the service friendly and attentive, but most important, the food top-notch. Well thought menu, and excellently prepared food. I can only say I can’t wait to come back again and try out Chef Corrado’s regular menu. 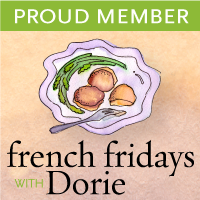 Tune in tomorrow for my thoughts on my Summerlicious experience at Frank. The Food Junkie July 28, 2011 at 8:50 a.m.
Bonita July 28, 2011 at 10:06 p.m.
Let me know if you want to do Winterlicious there when the time comes. Would love to go back!